Introduce your skin to the benefits of professional skincare with Guinot & Dermlalogica trained skincare experts. New! Firming treatment for face, neck and decollete. The Relaxation Treatment -powered by essentials oils, this luxurious, holistic treatment uses carefully selected plant concentrates to bring natural beauty to your skin. The Ultimate Anti-Ageing Treatment - the pinnacle of anti-ageing treatments, Age Summum, uses pure Vitamin C, Hyaluronic Acid and ProCollagen to target the signs of ageing. Active ingredients are penetrated into the skin using the exclusive Age Summum anti-ageing facial massage. Fine lines and wrinkles are smoothed and the skins youthful radiance is restored. A skin renewal treatment, which helps to erase visible signs of ageing. A real alternative to astitic medisin. Perfect for all skin types, this will unveil a radient complexion, treat dark spots and brighten skin tone. A five stage facial combining cleanse, tone, peeling and essential oil massage, topped off with a refreshing and vitalizing mask. The Instant Eye Repair Treatment - this unique treatment targets signs of ageing and tiredness around the delicate eye area, including fine lines, wrinkles, puffiness and dark circles. My be added to any Guinot facial just add £18. The Deep Cleansing Facial - designed to deeply cleanse the face, this 30 minute treatment uses a unique combination of hands-on massage and the Thermoclean patented heated device to rid the skin of its impurities, whilst also warming and relaxing the skin. Following the deep cleanse, a choice of massage or mask is offered leaving the skin instantly brighter and clearer, with a radiant complexion. The Star Treatment - discover visible results from your very first treatment with Guinot's exclusive Hydradermie2 Facial. Adapted to your skin type and concerns, this unique innovation enables fast and deep penetration using double ionisation technology combined with active ingredients, resulting in exceptional effectiveness. The Anti-Ageing Star Treatment - clinically proven to improve wrinkle depth by up to 49.5%*, this specially designed anti-ageing Hydradermie2 facial focuses on the eyes, face and neck to target signs of ageing. The Instant Lifting Treatment - Hydradermie Lift brings revolutionary youthfulness and renewed tone by stimulating the muscles and providing a massage that lifts the facial features. In the same way that body muscles are "sculpted" at a gym, this treatment adds a spectacular "lift effect" to your face after just a few sessions. The Express Treatment - for those who are in a hurry and need quick results,this treatment includes cleansing, exfoliation and muscle stimulation restoring a youthful tone to the complexion. The Ultimate Lifting Treatment - a combination of the Hydradermie2 Age Logic and the Hydradermie Lift will leave your skin looking fresh and radiant. Experience an immediate lifting treatment through the stimulation of the muscles, lifting the face, adding firmness and leaving an overall younger appearance to the face. Duration: 1 hour 45 minutes approx. A mini treatment that can be adapted to all skin types. Based on Dermalogia zone-by-zone face mapping skin analysis this treatment is 100% customised to meet your skin needs. Using electrical modalities to power up the skin treatment - choose one ofthe following: Age Smart®; Ultra Calming; Medibac. Duration: 1 hour 15 minutes approx. For when your skin needs more in-depth attention. This treatment starts with a back masage. The facial includes cleansing, deep exfoliation, extractions, the use of galvanic and high frequency to allow greater product penetration and to generally power up the results. This facial will leave your skin cleansed, nourished, bright and glowing. Duration: 1 hour 30 minutes approx. This makes use of essential oils extracted from plants, herbs and flowers. The complete body and mind are detoxified and re-balanced. This relaxing and energising massage uses essential oils for a moment of pure bliss. This relaxing massage provides you with amazingly soft skin and a feeling of well-being and serenity. This complete body exfoliation with a sugar-kiwi scrub is followed by a shower and a vigorous massage with energising essential oils, designed to thoroughly detox and revive the entire body. Express Exfoliating - achieve firm and silky-smooth skin with this complete body exfoliation eliminating dry, flaky skin, and refining the skin’s texture. This is followed by a shower leaving the skin soothed and refreshed. Reflexology can be used to restore and maintain the body’s natural balance and encourage healing. Reflexology treats the whole person, not the symptoms of disease. Most people benefit from treatment. It is a natural way of relaxing, balancing and harmonizing the body. The perfect antidote to a stressfull lifestyle. Includes a full back, neck and shoulder massage, facial cleanse, massage and mask. Finish with a therapeutic scalp massage. Back massage, including mini facial, scalp massage and foot massage. Ideal to ease away stress and strains of every day life. Deep cleansing using steam to remove blocked pores and to purify. Ideal for problematic skin for this much neglected and hard to reach area. The treatment helps to relieve sinus pain and congestion. Helps reduce stress and headaches. Included in this treatment is a facial cleanse and pressure point massage. Focusing on the pressure points of the shoulders, neck and head. Thistreatment promotes relaxation, relieves headaches and reduces stress and tension. Indulge in sheer relaxation and enjoy the sensation of a warm smooth oilstone massage. The specific technique uses balance to soothe andinvigorate your body and mind. A truly wonderful experience. A nuturing experience for the expectant mother to be. A radiance facial to relax including neck & shoulder massage, followed by manicure and pedicure. Duration: 2 hours 15 minutes approx. Combination of ear candle treatment followed by reflexology. Total relaxation and indulgence. A traditional method of hair removal using strip wax, suitable for all areas of the body. Half leg, bikini & underarm wax, eyelash tint, eyebrow shape and file & paint. Half leg, bikini line (standard), underarm and receive an eyebrow wax free. A proven method for permanent hair removal. Effective on any skin and hair type. 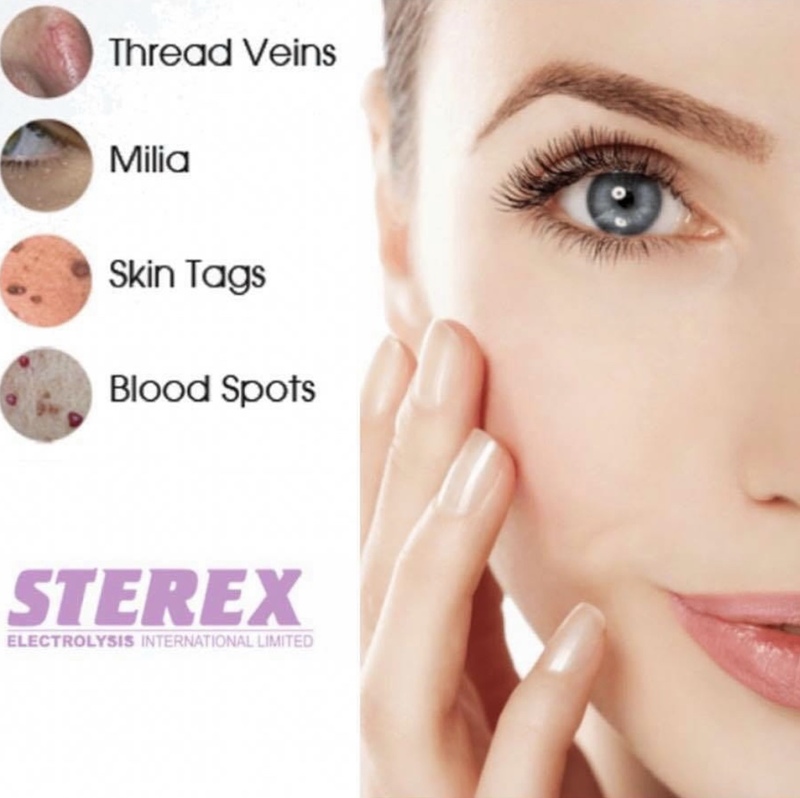 The removal of red veins, skin tags, milia, spider naevi and cherry angioma. A.C.P. Treatments use surgical electrolysis, which is only available from advanced skin therapists who have completed this further specialised training. Please schedule a consultation and patch test with Gillian. Cataphorefis is applied post treatment, electrical pluses penetrate aloe vera soothing and disinfecting gel into the skin to promote healing. A method of hair removal using a completely organic and natural sugar paste. This method removes the hair in the direction of growth, making ideal for those who are unable to have traditional wax or who struggle with persistent ingrowing hairs. IMPORTANT - you will need to visit the salon for a patch test at least 48 hours prior any tinting, eyelash lift, Henna to ensure no allergy exists. If you know of any eye disorders in the past, please discuss this at time of booking. 5-step process designed to re-shape your eyebrows. This is a semi permanent method of lifting your eyelashes enhancing the appearance of the eyes and will normally last 4-6 weeks. This treatment includes an eyelash tint. Lash Perfect semi-permanent eyelash extensions look and feel so natural, they can be worn every day. The extensions are bonded to your own eyelashes and will last the cycle of natural lashes. Henna treatments are a natural method of achieving a more full and define brow, using entirely plant based ingredients that offer a safe dying process. HD Brows are as individual as fingerprints and so each step of the HD Brow treatment is completely bespoke from the personal consolation, shape design, tailoring and aftercare process. Exclusive Beauty uses make-up by exclusive cosmetics, SOSU, Pippa Pallette and all the best leading brands. All make-up prices listed below are for make-up applied in the salon. If make-up is required at home a call-out rate will be charged, please contact the salon for a quote. All wedding bookings require a non-refunadable 50% deposit and will include a call out charge. Soak & file, cuticle tidy, application of hand cream and polish of your choice. An exclusive manicure plus a soothing bath of warm paraffin that creates a heat maintaining barrier for expanding the pores and allowing moisture to penetrate more readily. Excellent for dry skin and cuticles or swollen and inflamed joints. For a pedicure or toe nail paint please bring open toed sandals. Foot soak, nails filed, cuticles tidied, foot file to remove callouses and hard skin, application of foot lotion and your chosen nail polish. Foot soak, then foot scrub to exfoliate, followed by the use of foot file to remove callouses. Your feet are cream drenched, paraffined, primed and polished to perfection. Your feet tell a story, as many reflexologists will tell you. They are often the most neglected parts of the body even though they carry us around all day. So this treatment begins with a deluxe pedicure followed by a reflexology session. BLISS! Extensions are for added lengths or shape of shape lasting up to 2 weeks. A guaranteed finish that lasts up to two weeks and is applied to the natural nail. Note: Gel Nails can be easily removed by soaking in Acetone. PLEASE NOTE: All parties are for six angels or less. At least one adult must accompany angels at all times! Before tanning hair removal is required at least 24 hours before treatment. Please wear loose dark clothing (including loose footwear to avoid marking your tan). Any flaws in your tan must be reported to the salon within 24 hours of application otherwise no claim can be made. Please wear no make-up, deodorant or moisturiser when coming for your tan. As we cater for all our clients tanning needs, we stock a range of tanning solutions. Ask your therapist for advice on which tan will suit you best. All spray tanning is applied via an airbrush and is dry in minutes. Our tan room has extraction for a more comfortable experience. The result is quick, streakless and gives a natural looking all-over tan. We also provide a lovely rub on tan which is suitable for those who just want a hint of colour and natural glow. It is applied with a tanning mit directly to the skin and dries almost instantly.